Andea eBox is a comprehensive equipment monitoring solution that can be deployed in a few days. 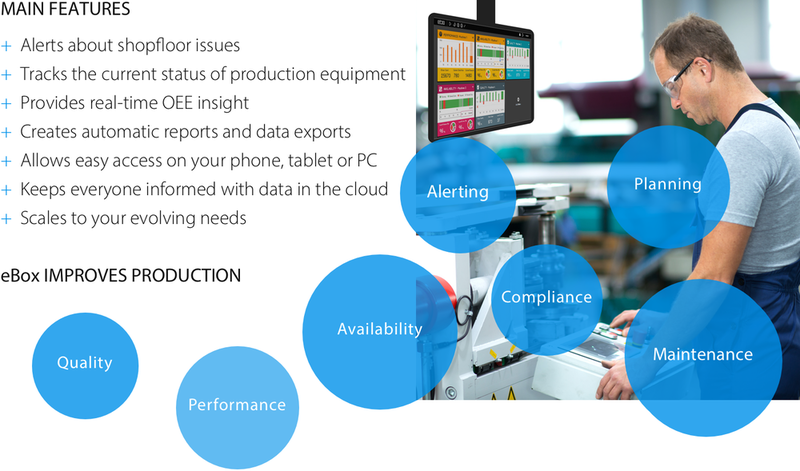 Track Performance, Quality, Availability, Tasks and Alerts on any machine. Andea eBox is used by Embraco to track the availability and performance of press and bore milling machines. Sudzucker applied Andea eBox to monitor the OEE of a sugar packaging line. At Novelis, Andea eBox is being used to monitor the production of aluminum rolls and maintenance alerts. See how Andea eBox keeps Operators, Managers, and Analysts informed. We can provide you with more detailed information and you can even schedule a demo to see it in action for yourself. Andea specializes in delivering manufacturing technology services and solutions; from conducting technical assessments and providing strategic manufacturing systems to managing global MES rollouts. Our employees are process experts in the fields of production and logistic, quality management and production data analysis. We have successfully delivered tens of global manufacturing system implementations in various industries including; Automotive, Aerospace & Defense, Packaging, Medical Devices, FMCG and Industrial Machinery & Equipment.